It is important to know that the “Modeling” window (in Model Mode and in Bone Mode) is only used to create your model and bones in your model file. This is not the window where you can actually pose or test your model’s rig or rig’s bone hierarchy to see how it works. In order to test our rig we will use a different kind of window called an “Action” window. In this tutorial we are going to start off in a “Modeling” and then we’ll open an “Action” window in a later section when we are ready to test what we have laid out so far. Blank Project in the PWS A new project file. For this section, all that we are going to cover are the Modeling and Bone Modes from within a Modeling window. You’ll have to understand this section first before you can understand the sections that follow. We are going to start by creating a new Project in the Project Workspace (PWS). You can delete everything in the project so that all of the folders in the project are empty. 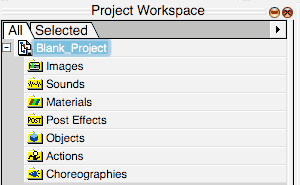 I have renamed my project “Blank_Project”. Created a new model named “Bones_Tutorial”. For this portion of the tutorial we are only going to be working in the “Objects” folder in the PWS. Create a new model file in “Objects” folder in the PWS. 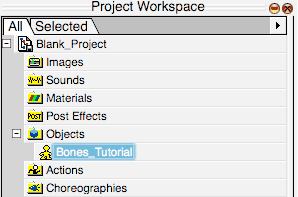 Once you do that you can change the name of the model file to “Bones_Tutorial” like I have here. 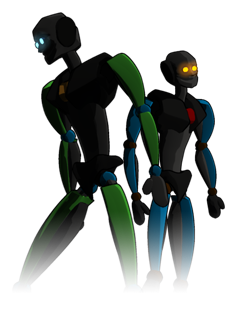 Go ahead and open your “Bones_Tutorial” model file from the PWS. 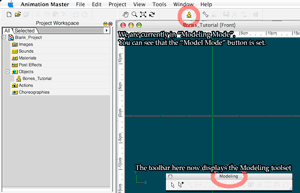 It will open and display a window which defaults to “Modeling Mode” in the [Front] view. 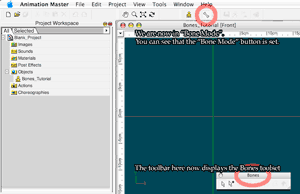 Since we are not dealing with any model geometry (model mesh) in this section of the tutorial we will switch from “Modeling Mode” to “Bones Mode” by clicking on the “Bones Mode” icon in the Mode Toolbar. If you have not customized A:M’s user interface a great deal before you began this tutorial then at this point you may have noticed that your “Modeling Toolbar” has been automatically replaced by the “Bones Toolbar”. This is a subtle but very important item to take note of. Now that we are in “Bones Mode” in this window we do not have access to the toolset from “Modeling Mode”. That’s alright because the modeling tools have no use here so there is no need to worry. If you want to access the “Modeling Mode” of your model again then just simply switch back to it by clicking on the “Modeling Mode” icon on the “Mode Toolbar”. For now, stay with me here in “Bones Mode” for the next section.